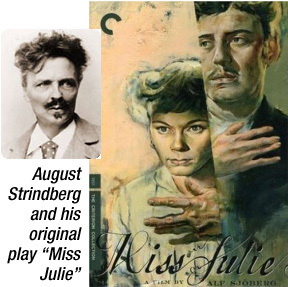 A Review and Synopsis of Robert McKee's screenplay "Miss Julie Montgomery"
Skip 20 years, and John is now butler to Miss Julie's father, a prominent judge making his way up the political ladder. The tension mounts from the moment the professionaland racialbarrier between John and Julie is crossed until it inevitably (although we never cease hoping otherwise) culminates in a rapid fire explosion of shocking and tragic scenes. McKee's Miss Julie Montgomery is a prime example of what a screenplay can and should be. It reads like a fully imagined novel, McKee's descriptive yet precise prose transforming language into a film in the minds eye. It is as if McKee has completely envisioned the story in his imagination and plucks just the right words to artfully bring it alive, while swiftly carrying the reader up and over his narrative arc. He sets the scene from the wide lens to the most exquisite detail, from the grand curving staircase and mammoth chandelier to a prism in the window that breaks the sunlight into a spectrum. McKee goes far beyond describing the scene, dialogue and action. He provides insight into nuances of character that only the most deft actor, director and cameraman could conveythe indicator that a writer knows his characters inside and out, the emotions that lie behind their words and behavior, the experiences that have made them who they are. It is the writing of a novelist, who has to create an entire world to convince us to believe in it and be moved by it. 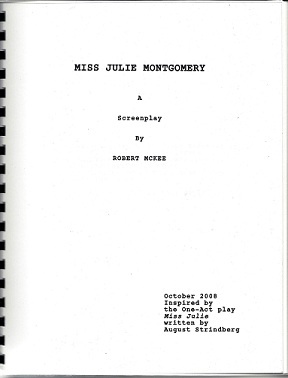 Not only is Miss Julie Montgomery a pleasure to read and a work of art in and of itself, but it also illustrates McKees teachings in actual screenplay form; it allows us to see his understanding of the craft translated into a finished workwhich, ultimately, is why we hungrily read his classic tome, Story, and attend the Story Seminar. Miss Julie Montgomery is proof that McKee can walk his talk.